Chichen Itza was an ancient Mayan city located in the Yucatan Peninsula. Aside from being a popular tourist attraction in Mexico, it remains an active archeological site, which continues to provide knowledge about Mayan culture and society. Chichen Itza was an ancient Mayan city located in the Yucatan Peninsula. Aside from being a popular tourist attraction in Mexico, it remains an active archeological site, which continues to provide knowledge about Mayan culture and society. It was named a UNESCO World Heritage Site in 1988 as well as one of the New Seven Wonders of the World in 2007. 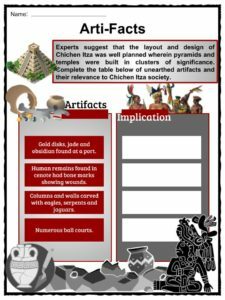 See the fact file below for more information on the Chichen Itza or alternatively, you can download our 24-page Chichen Itza worksheet pack to utilise within the classroom or home environment. The Itza were an ethnic group of Mayans who thrived about 600 A.D. to 1221 in the northern region of the Yucatan Peninsula. 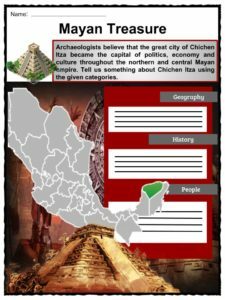 The term Chichen is a Mayan language word, which translates to “mouth of the well of the Itza”. The well refers to a series of underground rivers which lie beneath the city and became their main source of fresh water. Chichen Itza was built to be the center of political, economic and cultural power of the Mayan civilization. 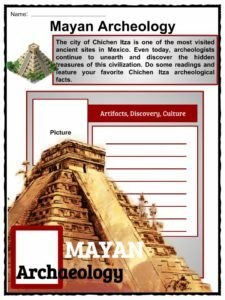 Based on archeological evidence, Chichen Itza was one of the largest Mayan cities, covering five square kilometers of land area. The site was comprised of densely-packed commercial and residential structures made of stone. From 900 A.D. until 1050 A.D., Chichen Itza was the capital city which controlled the northern and central Yucatan Peninsula. Among the surviving structures in Chichen Itza includes El Castillo, The Great Ball Court and The Warrior’s Temple. All structures were made of stone and archaeologists believe that the Mayan people did no use wheels in the building of temples and pyramids. The buildings of the city were connected with networks of white roads called sacbeob. El Castillo is probably the most famous part of the city. It is a pyramid structure that was built on top of an older temple. 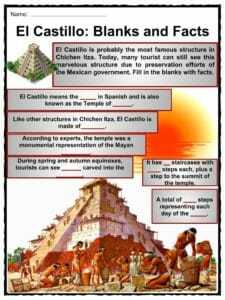 El Castillo is also known as the Temple of Kukulcan, which was built between the 9th and 12th centuries C.E. to serve as their representation of the Mayan calendar. On each side of the pyramid, there are 18 terraces, which corresponds to the number of months in a Mayan year. Moreover, there are four staircases with 91 steps each and a final step to the summit temple making 365 steps. At the northern end of the city, a large cenote, or sacred well, is located. 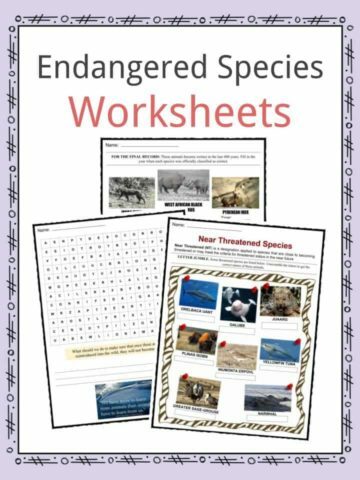 It was in the early 1900s when researchers found artifacts like gold, jade and human remains. Experts say that the human remains had bone marks indicating that they were killed before being thrown into the cenote. This part of the city was believed to have immense ceremonial significance to Mayan people. 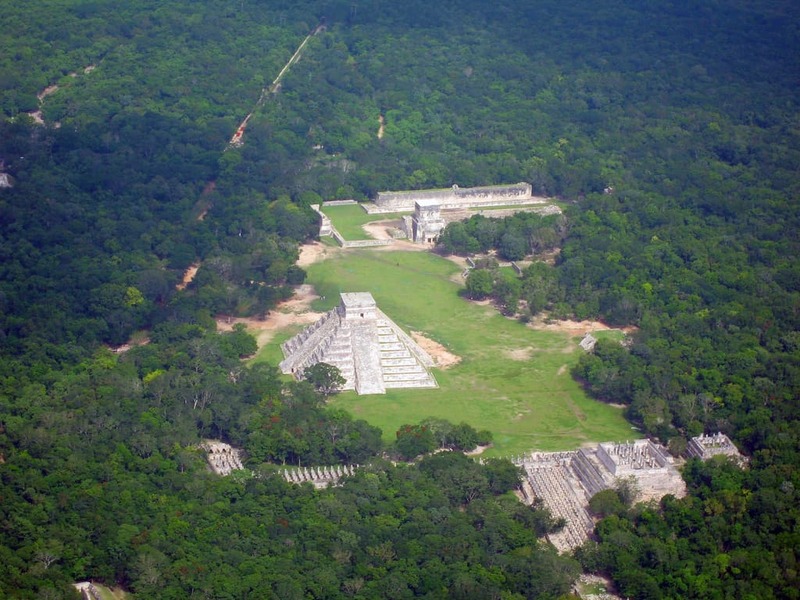 To the northwest of El Castillo was a huge structure used for sport known as the Great Ball Court. This structure suggests that ancient Mayan people were athletic. Moreover, 13 smaller ballcourts were also discovered. Adjacent to the Great Ball Court is the North Temple, also known as the Temple of the Bearded Man. The central inner wall carvings feature a bearded man. Aside from El Castillo, Las Monjas is also a noticeable structure in main Chichen Itza. Archeologists suggest that it was a governmental palace. Among other structural features are the Steam Bath, operated by heated stones, and Temple of the Warriors, which includes a large stepped pyramid and carved columns depicting Mayan warriors. At the southern end of the Temple of the Warriors is a square structure, which archeologists believe to be a marketplace. Very similar to El Castillo, but smaller, is the Osario which leads to a natural cave. One of the best-preserved buildings in the city is Casa Colorada, which means ‘red house’ in Spanish. It is called Chichanchob in the Mayan language. In one of its chambers, extensive carved hieroglyphs are found depicting Mayan rulers. Experts suggest that it may have been an elite residence. The Caracol is one of the most imposing structures in the city. 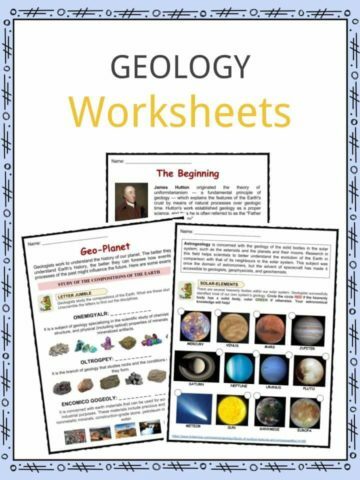 It was used as an astronomical observatory specifically of the planet Venus. Archeological evidence suggests that Chichen Itza was a center of trade with a port at Isla Cerritos. 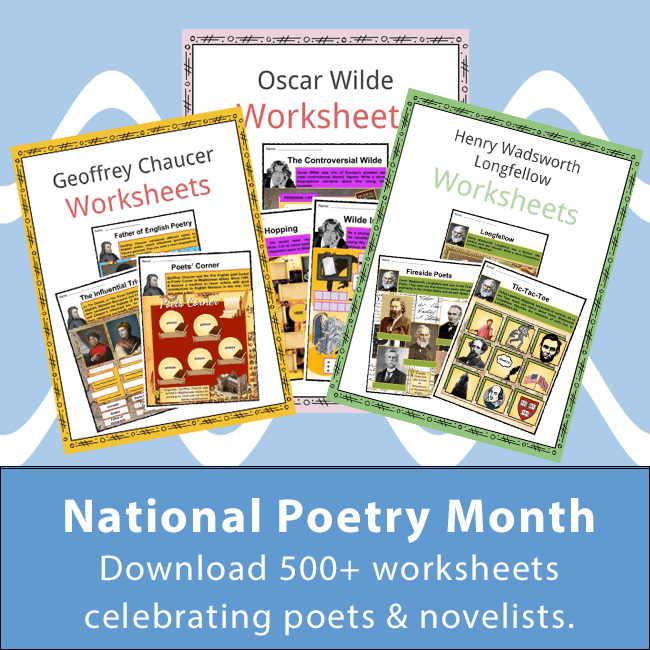 Artifacts of turquoise from the north, gold disks from the south and obsidian from the Isthmus of Tehuantepec prove such a theory. Cultivation of cacao and lucrative salt beds added to their economic prosperity. The site is abundant in monumental architecture with themes of militarism and symbols of warfare like serpents, jaguars and eagles. 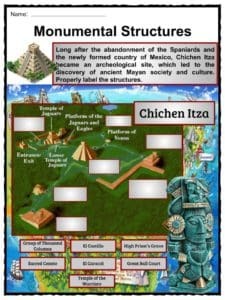 Even though much of the fall of Mesoamerican civilization was caused by European colonists like Christopher Columbus, historians believe that Chichen Itza lost its place way before the explorers’ conquest. Experts suggest that the Mayapan community, which emerged to the south and west of Chichen Itza, caused the decline of the great city in the mid-1200s. To support this claim, some evidence points to the city being raided and looted. When the Spanish conquistadors arrived in 1526, there was a struggling community living in and around the city until a temporary Spanish settlement was built. By the mid-1800s, Chichen Itza, long-abandoned by the Spanish, became an architectural site until today. Every year, over 1.2 million people visit the ruins of the city making it a marvelous tourist spot. 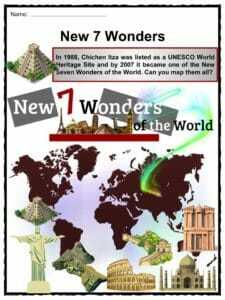 In 2007, Chichen Itza, along with the Great Wall of China, Machu Picchu, Roman Colosseum, Petra of Jordan, Christ the Redeemer, and Taj Mahal were listed as the New Seven Wonders of the World. 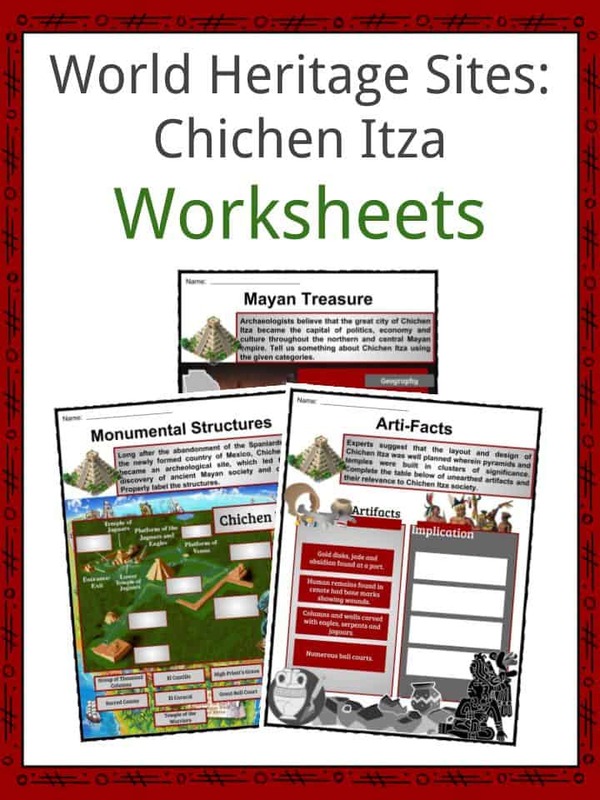 This is a fantastic bundle which includes everything you need to know about Chichen Itza across 24 in-depth pages. 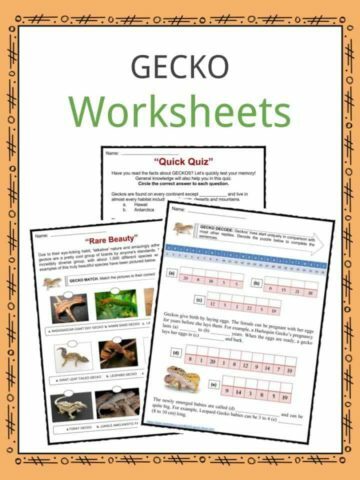 These are ready-to-use Chichen Itza worksheets that are perfect for teaching students about the Chichen Itza which was an ancient Mayan city located in the Yucatan Peninsula. Aside from being a popular tourist attraction in Mexico, it remains an active archeological site, which continues to provide knowledge about Mayan culture and society. It was named a UNESCO World Heritage Site in 1988 as well as one of the New Seven Wonders of the World in 2007.